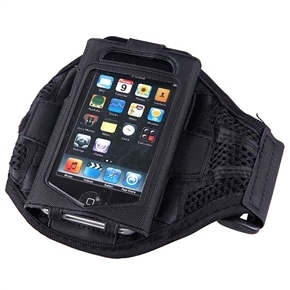 This black armband for iPhone 4 or iPhone 4S features soft & durable black mesh, which is breathable and keeps your arms comfortable while running or exercising. And the transparent faceplate allows you to see through and access all functions of touch screen navigation without removing the holder case. - Perfectly suit for iPhone 4 and iPhone 4S. - Good to hold your cell phone while doing sports. - Clear faceplate serves as a screen protector. - Velcro closure allows you to put on/ take off the band easily. - Adjustable belt provides a snug fit around arms of most sizes. - Can be washed and reused. This was my first time to order from this website. I was very pleased that I did and will be ordering other things in the future. The product was received as described and although it was shipped for free, it was here sooner than expected. Item received quickly and exactly as described. Good Seller!! Received the item earlier than what's promised! Excellent seller, Great deal, thanks.